Bitcoin is revolutionising how money is spent, accepted and stored. It is quickly becoming a popular form of alternative investment for millennials. At present, there are many ways to buy Bitcoin. However, being a regular saver and a fan of the dollar cost averaging concept of acquiring assets. I wanted a way to regularly buy Bitcoin. But I running into the issue of paying a high transaction cost for small purchases. So in early 2017, my business partners James Viggiano and Jack Daffron, hugely excited about the investment opportunities that cryptocurrency presents, decided to build an app that would help us capture this opportunity. 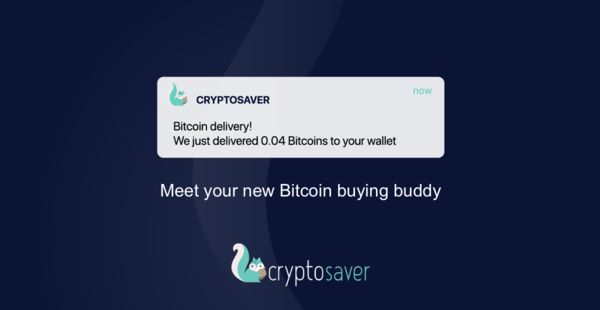 That's when Cryptosaver was born. High complexity in actually converting your hard earned money into crypto. So we set out to tear down these two barriers. Easy, reduce complexity and reduce transaction fees, how do we do this? Through making the process as simple as possible, combined with a beautiful platform — we can make buying Bitcoin (and other cryptocurrencies) affordable (low transaction costs) and incredibly easy. You get the best price available. Bitcoin is sent straight to your wallet — no need to withdraw from an exchange or other third party wallet. Apart from setting up a wallet, there is no technical knowledge required. Low fees (3–5% commission on the best market rate). Cryptosaver takes the concept of a brokerage one step further. We are also a savings platform — you can set aside a regular amount of money (for example, $50 per week) to purchase bitcoin. By setting up a regular automatic payment, it is simple and easy to purchase bitcoins on autopilot. This investment strategy is also known as dollar cost averaging (DCA). In volatile markets, large price swings can easily erode investors returns when investments are made in a lump sum rather than being spread out over time. By purchasing a regular amount of bitcoin on an ongoing basis, you are able to get the average price over time. When the price rises, DCA forces you to purchase less bitcoin, and vice versa when the price drops.